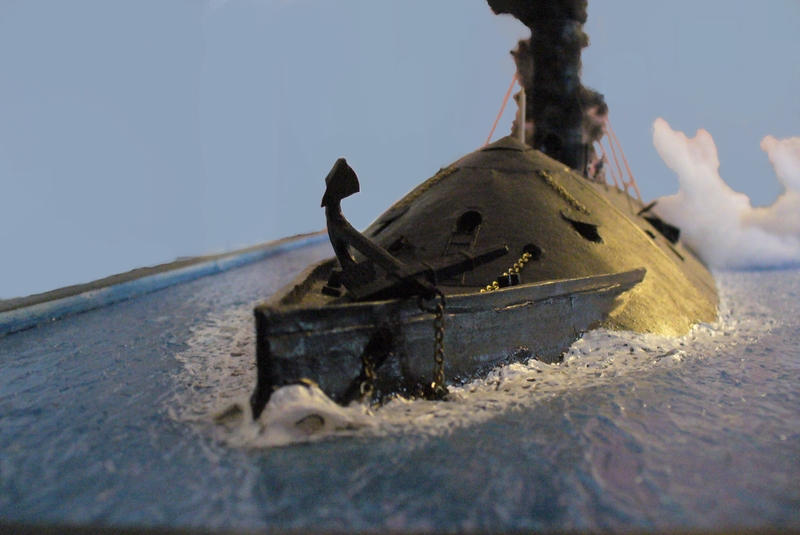 We started this diorama in 2012, in honor of the 150th anniversary of the battle at Hampton Roads, Virginia, between the CSS Virginia (Merrimack) and the USS Monitor. This battle ended as a draw, but it proved that the age of wooden ships was over. The Virginia had already destroyed two ships the day before, with great loss of life in the Union flotilla. In contrast to the hundreds of Union casualties, the Virginia lost two killed and eight wounded. The night was a very dark one for the Union forces, and the Government in Washington, D.C. was in a panic. When the Monitor appeared, no one put much faith in the tiny, odd little thing. She looked like nothing more than a snack for the great iron monster of the day before. It seems only her commander, Lt. John Worden, believed she could withstand the Virginia. In the morning, when the Confederate ironclad appeared, Lt. Worden immediately put his little ship in between her and the grounded USS Minnesota. For hours, the two ironclads pounded away at each other, with no apparent effect. At the end of the battle, all the ironclads had to show for it were some dents and a few wounded on each side (including Lt. Worden). The contrast to the carnage of the day before must have been shocking, and led both the Union and the Confederacy to build more ironclads. Rebecca made the ships for this diorama from scratch out of cardboard, wood, and paper, right down to their hulls, anchors, and propellers. She meticulously researched and duplicated the pattern of ships’ wakes given the estimated speeds and shapes involved. Ask us to show you inside the Virginia‘s casemate and the Monitor‘s turret and pilot house. 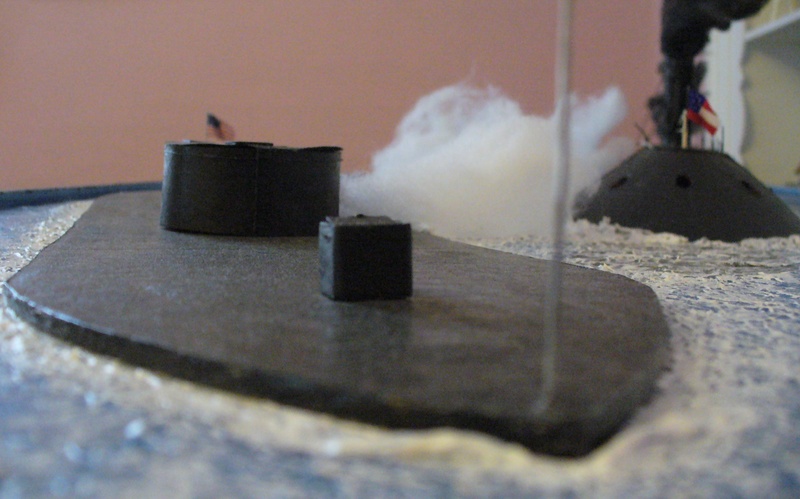 You can even check out the ships’ hulls through the “portholes” drilled in the right side of the diorama!